I selected the ingredients for this masala mostly from the recipe below: Russet potato, cumin seed, jalapeno, fresh ginger, garlic, garam masala, curry powder, cinnamon, turmeric, canola oil, water, yellow onion, chickpeas, green peas, cilantro, but I also stirred in about 3/4 cup of goat milk yogurt at the same time as the frozen green peas. For the dosas, I used half all-purpose flour and half rice flour and added a bit more water until the batter spread thinly in the pan. Also, it was easier to spray the pan with cooking spray than to brush it with oil. Some restaurants prepare a similar delicious dish, presenting a crispy dosa impressively as a tube larger than the dinner plate. Here’s a detailed recipe from Tahmina for a similar curry that might be useful to you! 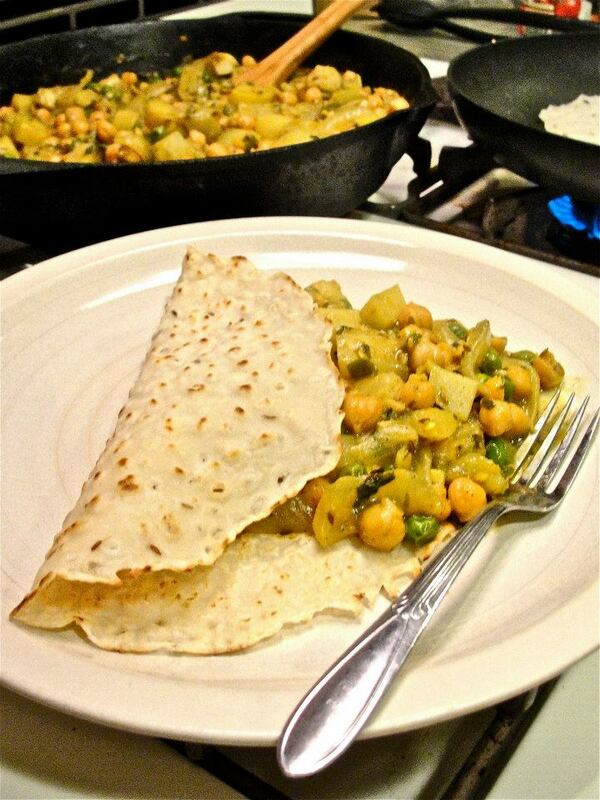 Dave, have you ever made the traditional lentil fermented dosas? If so, I’d love some pointers. I struggle with mine. Nope, but now I’m interested in it. I was thinking to experiment with just rice flour anyway, so make them for my friends that are off gluten.